Valerie Djurhuus is an Algerian-Danish artist and rapper who came to Berlin five years ago for music and to study Middle Eastern Studies. 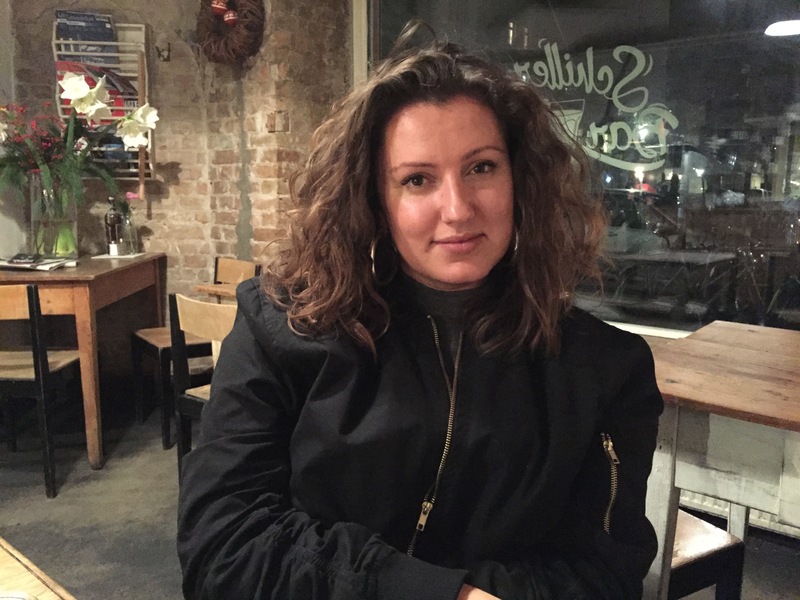 Today her “chaotic and beautiful life”, as she likes to call it, includes running workshops on rap, theatre and spoken word at Schilleria, one of Give Something Back to Berlin’s first partners. On January 27, Valerie will be hosting a workshop about personal storytelling through writing and music in collaboration with Give Something Back to Berlin, called “Write your story”. Valerie spoke to Vanessa Ellingham about empowerment, gentrification and how she uses her imperfect German skills as a strength. Valerie Djurhuus. Photo: Vanessa Ellingham. Okay, so tell us about Schilleria. Schilleria has existed for 15 years. Schilleria is a so-called safe space. It is a girl*s club. Which means, primarily, a place for girls between the ages of seven and 21 to hang out, do whatever they want to, on daily basis. We are also expanding it to accommodate the “*” part, because, of course, trans girls are more than welcome as well, and we have positioned ourselves as such. We provide certain opportunities for young people in this area who, without us, wouldn’t have access to certain education. We provide support on homework. We advise them on how to plan for their lives in the future. We run a lot of workshops on empowerment, so a lot of different methods are applied, but the goal is to strengthen their self confidence. And what do you do at Schilleria? I do a couple of things. First of all I manage the work group for queer youth. Once every six weeks many different professionals from Neukölln and Kreuzberg come to talk about different themes. I created this group and my job is to provide the workshop, the education and so on. I also have a theatre project that I wrote with a colleague. I manage it from start to end and it’s about taking the stage. It’s actually called “Wir nehmen uns die Bühne”, “We take the stage”. It’s a theatre project, an empowerment project, and a cultural educational project. The people we’re educating is more the audience and the creators of opinion in society here in Berlin, who talk about young girls and people in general from Neukölln as not really wanting to change, or wearing the hijab or niqab, and that they therefore won’t have the same opportunities. This is a space where the participants bring it, and they tell us what they are, not the other way around. Rap and dance, choreography, drums and percussion are the main methods, but basically it’s up to them to create this show and that is a very very frustrating process. It’s also extremely fun. But it’s frustrating for them because they’re learning how to be a moderator, to create something on their own and I see they are not used to just being given the mic. Basically it’s all about their voices, how they want to say what they have to say, and I don’t want it to be filtered for a grown audience. It’s up to the grown audience to just understand it on their own. A video about a rap song the Schilleria girls wrote with Valerie and Sinaya and performed for International Women’s Day. Video: Misja Goossens. What made you decide that Schilleria was the place for you? I study Middle Eastern Studies and I’m also of Arabic background. To me I always knew I was going to work in the field of intercultural “this and that”, and from an academic context I just didn’t find anywhere where I thought I fitted in, or where it was fun or made a lot of sense. I like to do my work somewhere where there’s an immediate response, and not where I have to prove myself to a lot of academics. So I applied for an internship at Schilleria, two years ago. And I think within about two weeks they asked me if I wanted to provide rap workshops once or twice a week, and that developed into me working there more and also in other projects around Berlin. You’re a performer yourself. What kind of performing do you do? I haven’t performed for a while. But when I do, it’s basically spoken word or classical 90s rap. I’m very simple in my approach, I’m not a crunk or trap kind of person, I’m not deep in some specific hip-hop scene here. I like to just pop up when I feel like it. But my future is not going to be about my persona, our my stage persona, it’s going to be about my workshops and what I provide there. It gives me a lot more pleasure to get other people on stage. Empowerment, to me, as a workshop facilitator, is to first of all acknowledge that the empowerment taking place is not just on the participants’ side, that it’s a give-and-take of information and ideas. So my aim in my workshops is to let people know that what they already do and know is good enough. And that I’m not here to tell anyone to be like me, or that I’m the example of anything better. My job there would be to support this individual and let them know that their authentic self is quite ok. It’s about providing them with methods of practicing being what they are, to begin with. So deciding what it is you want to tell people about yourself, and practicing taking up that space. Or they might think they don’t have anything to say, that their voice is not important, or ask why they would want to talk about themselves. And often there will be comments about how rap or writing about yourself is for boys or men. But usually after a while they say, “here I am!” And then they’re fighting for space and time to tell their stories. So they open up completely, which is my goal. A video showcasing Schilleria’s cultural work. Is your Algerian-Danish background something that helps you connect? Definitely because, first of all, I’m not an English or German native speaker, and that says something to people who are already ostracised or marginalised, that I’m not perfect. And I use that a lot in my workshops, as an example. I emphasise that, because I think it’s important that this imperfection is what is making you special and unique and that they don’t have to strive for perfection, but for authenticity. I also talk about my roots, and my different experiences with being in at least two or three different cultural contexts, sometimes at the same time. That can make me feel ostracised too, and most of them know that, because most of them have other ethnic backgrounds than white German. I think those conversations are some of the most important in the beginning, for us. Schilleria’s been having a difficult time lately. Where are you at now? Our rental contract was terminated three months ago with the opportunity to negotiate the price. They tripled the price and they were not even sure if they would allow us to accept that offer, or whether we would be kicked out by the end of December. Our funding only covers one full-time person and one part-time person, and low rent. Everything else we write applications for to other organisations. We weren’t sure we could afford their new offer. So we fought and fought and last week we won the battle! Our rent will be higher, so we will have to negotiate, but we are guaranteed the space for five years. It’s funny because Schilleria tries to empower people but we were also empowered through this process ourselves. That was very beautiful. And also the girl*s in Schilleria were so motivated and they have learned so much from this experience, because they became an integrated part of mobilising against it. They were writing their own flyers and talking to people in the street, even coming into bars like in here, saying, “do you know we might get evicted?” Talking to everyone, giving them flyers. They were confronting people on their own privilege, which I think is one of the most empowering things you can do. Being like, “I’m going to fight for this place because it means something to me. I’m eight years old and I know what I’m talking about. Let me talk to this 40-year-old director of a coffee company about how he needs to support this.” And it worked! A video of Schilleria’s project, “Girls become political experts”, led by Vivien Bahro and produced by Misja Goossens. So much of the gentrification debate has centered on Schillerkiez, and businesses like this one. You can see the anti-gentrification graffiti when you come into the bar. What are your relationships like with the businesses in Schillerkiez? I think Schillerbar has a reputation that’s worse than it really is here. Schillerbar is also older than a lot of other businesses in this area and they have always been very supportive of us. But we haven’t worked together a lot with places we don’t like. When it comes to gentrification. Of course I invited you to come here because it’s also our Kiez. Schilleria is right across the street there. But I don’t sit in Schillerburger every day because I know that’s a place that has created a lot of change here, not necessarily in a good way. Actually with several of the most hip places, we have an agreement that, for every burger or whatever they sell, we get 50 cents, because they are influencing our rent, so we have these conversations with them. This is our active work. So when I sit here and I pay a little bit too much for a glass of wine, I know that some of that money is going to go right back to us. Are you able to say who you have deals with? Quartiermeister beer are the ones who have supported us the entire way through. Thank you to them! I don’t think you can fight the movement of gentrification completely, but you can choose with whom you enter a love/hate relationship. Vanessa Ellingham is the Editor of GSBTB’s Online Magazine.